Geoffrey Chaucer (1343-1400) is often referred to as the father of English literature and is best known for his 14th-century masterpiece The Canterbury Tales. Chaucer was the son of a wine merchant and worked as a diplomat and civil servant under Kings Edward III and Richard II. Chaucer wrote The Canterbury Tales in Middle English at a time when most books were written in either Latin or Italian. 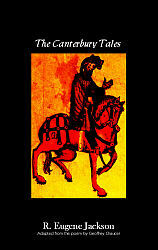 The Canterbury Tales is a collection of stories told by 29 fictional pilgrims while on a journey to visit Saint Thomas Becket’s shrine at Canterbury Cathedral. The tales are told within the framework of a storytelling contest, which was a common form of entertainment in England at that time. Most of the tales are comical, written in verse, and offer ironic, satiric portraits of medieval society. Some of Chaucer’s other major works include The Book of the Duchess, The House of Fame, The Parliment of Fowles, Troilus and Criseyde, and The Legend of Good Women.